The Dark Side of Social Media: Psychological, Managerial, and Societal Perspectives examines how social media can negatively affect our lives. The book tackles issues related to social media such as emotional and mental health, shortened attention spans, selective self-presentation and narcissism, the declining quality of interpersonal relationships, privacy and security, cyberstalking, cyberbullying, misinformation and online deception, and negative peer effects. It goes on to discuss social media and companies (loss of power, challenging control mechanisms) and societies as a whole (fake news, chatbots, changes in the workplace). 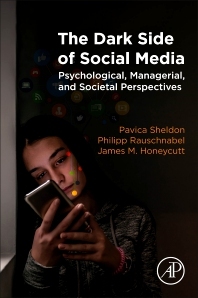 The Dark Side of Social Media: Psychological, Managerial, and Societal Perspectives empowers readers to have a more holistic understanding of the consequences of utilizing social media. It does not necessarily argue that social media is a bad development, but rather serves to complement the numerous empirical findings on the "bright side" of social media with a cautionary view on the negative developments. Dr. Pavica Sheldon is a Chair and an Associate Professor of Communication Arts at the University of Alabama in Huntsville. Her areas of research interest include social media and interpersonal communication. She is an author of two books (Social Media: Principles and Applications and Scripts and Communication for Relationships) and more than 40 articles published in academic journals, books, and other outlets. She has received a number of top paper awards. Dr. Sheldon received her PhD and a master’s degree from the Louisiana State University. Dr. James M. Honeycutt is an LSU Distinguished Professor of Communication Studies and winner of numerous research awards including the LSU Rainmaker Research Award. He has shaped research in psychology and family studies. He is founder of the Matchbox Interaction Lab, internationally recognized for his work in relationship scripts and imagined interactions. Honeycutt is co-editor of the interdisciplinary journal Imagination, Cognition and Personality.